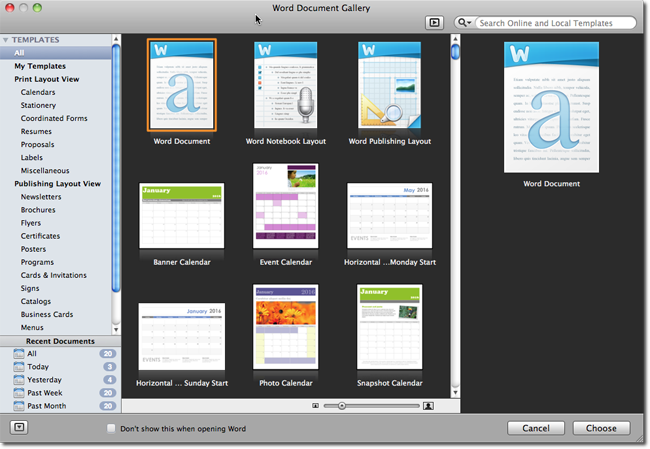 Office 2011 for Mac is going to be released in a couple of days, and we got our hands on the latest version already. 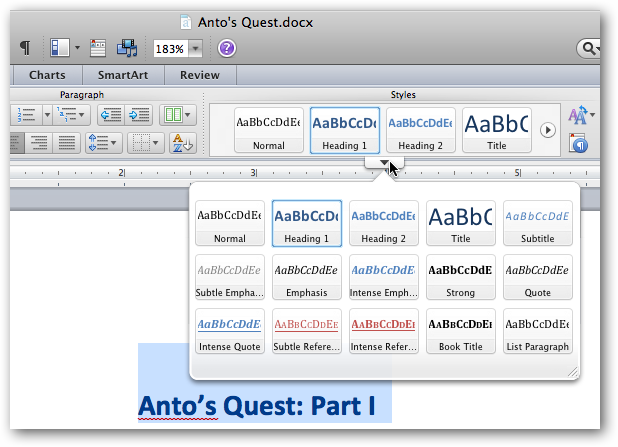 Here’s a quick tour of some of the new features in the latest version of Office. This new release brings many features from Office for Windows that have been missing or have not worked the same—for instance, Office now includes the Ribbon interface, and replaces Entourage with Outlook. Microsoft has brought the Ribbon UI to the Mac and has done it in a way they think Mac users will appreciate—they have taken their research of user’s experiences and grouped the most used tools together to allow for a better experience when working with your documents. You’ll notice that they did a really good job of combining the Ribbon with a more Mac-like feel. Here’s part of the Ribbon for Microsoft Outlook, which has all the most common tools on the toolbar. Here’s the full Ribbon for Word, Excel, Powerpoint, and Outlook—click through to show the full-sized view for each one. 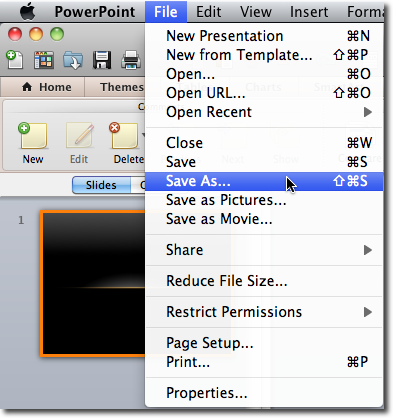 You’ll also notice that the “Save As” key command of Command + Shift + S has been brought back to the suite, allowing cross-platform users to have the ease of use they may have missed in Office for Mac 2008. Office:mac 2008 did have the ability to share your documents though the plugin that was available, but now you can use your companies SharePoint servers or share your documents with others using Microsoft’s SkyDrive. 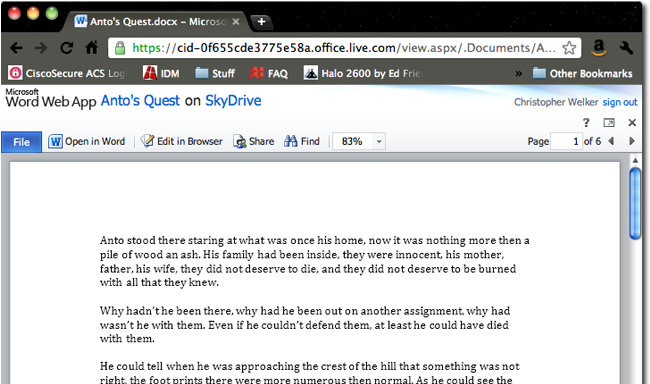 To save to your SkyDrive, you will enter your live account information. 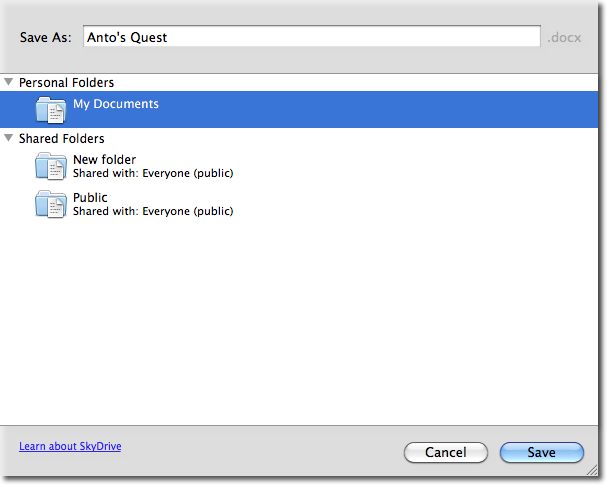 And choose the location for the file to be stored. Now you can view the file just like any other Office Web App document. 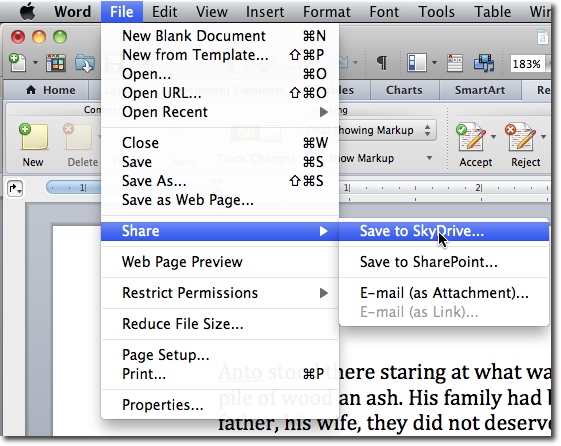 If you are using Office, more than likely you will use Word. The popular word processing application has some noticeable enhancements, the most noticeable of which is the quickness of launching the app—compared to Word 2008, the new version opens in a snap. The Ribbon adds a more familiar experience. 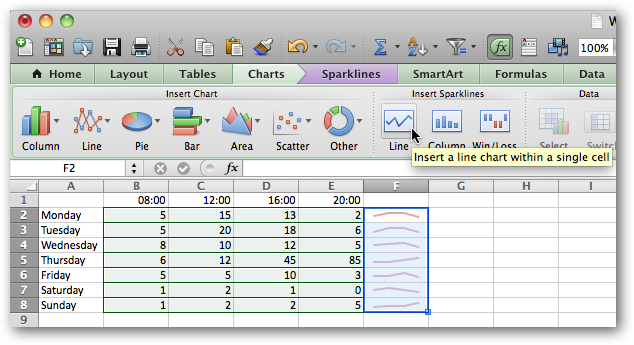 One of the features to find its way to Excel is Sparklines, which let you graphically show off data within a cell. 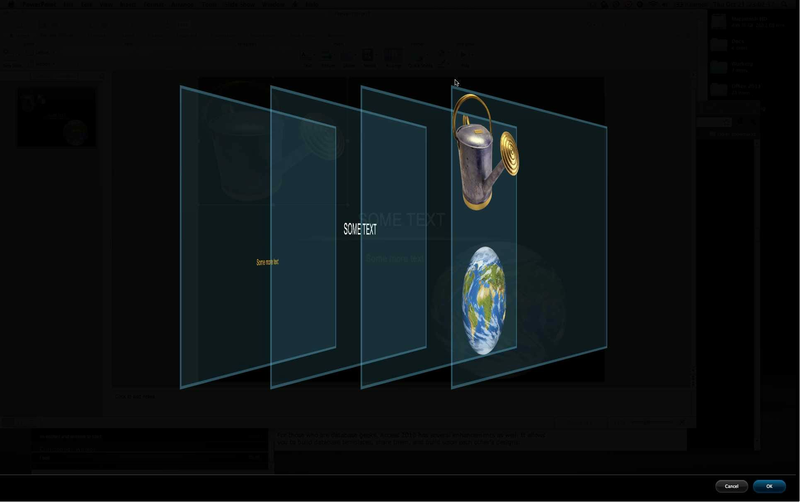 A cool new feature in PowerPoint is the full screen layer rearrange tool. 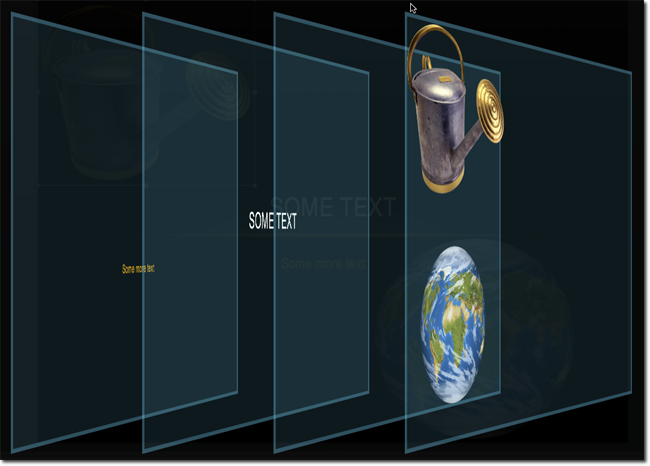 The tool also has the option to view only those images that overlap. Exchange users have reason to be excited, since they no longer have to use Entourage. This Outlook version has most of the same features that the PC version has, including Rules, Calendar, Contacts, and support for Microsoft Exchange. Click through for the full-size image. With Office:mac 2011 due to be release later in October, the Mac Business Unit of Microsoft boasts their best version of the popular productivity suite. 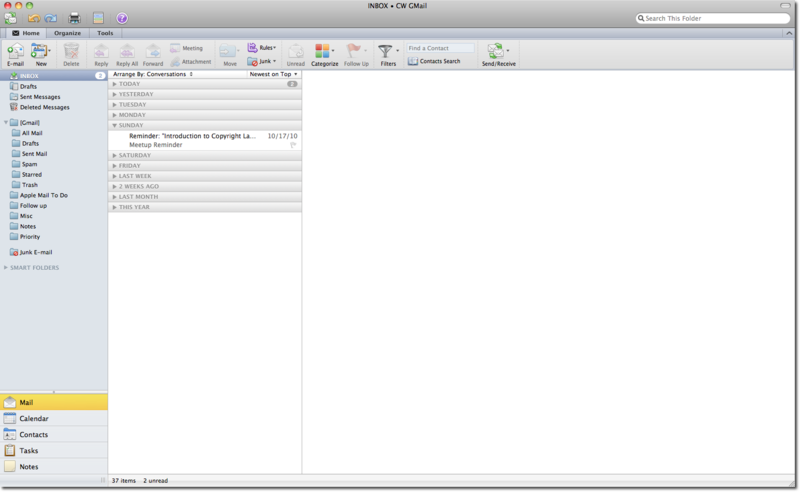 With just a taste of the new features shown here, the new version will be a great tool for Mac users who appreciate the MBU’s outlook on making Office:mac a more OS X aimed experience.